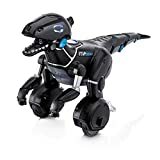 The reptile Roboraptor WowWee, fascinating for its size and quality of performance, will bring a lot of joy to the child, in whose house it settles. The toy is just awesome. It seems that after millions of years, dinosaurs come to life again. And perhaps this is thanks to modern technology. The dinosaur moves on two massive paws very quickly, moves its tail and head, like a real one. He makes a terrible growl and may even bite, so for very young children is not suitable. But in older adults, the robot Roboraptor WowWee causes delight. The toy looks unusually realistic and completely copies the habits of a predator, is distinguished by autonomous behavior, biomorphic movements, direct control. Looking at the ancient predator from the side, it seems that the era of dinosaurs has returned. Its size is quite large – 85 cm. In height. The box itself is so beautiful that the baby is delighted from the first minutes. Having unpacked it, the child will find a rather large dinosaur Roboraptor WowWee, the size of which from tail to head is 77 cm. It is possible to control a formidable reptile made by NASA specialists using the most modern technologies at a distance, for which a console is provided in the configuration. With it, the child will quickly learn to control the animal. It is decorated in black and white color, equipped with a magnetic gray track, which reproduces the appearance of a reptile. The buttons, on the one hand, are designed to control the movements of the Roboraptor WowWee case, on the other hand, they are responsible for movement in space. The material from which the console is made, all the same, high-quality Eco plastic. Older children will be attracted to programming a toy for different modes: it is programmed for the game mode, like a puppy, will try to take the napkin away from the child if it is put in the corner of the mouth, or will almost gently purr when stroking. 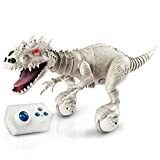 If the robot dinosaur Roboraptor WowWee is set to the mode of caution, then, having heard loud noises, the dinosaur will run away, fleeing danger. In the hunting mode, on the contrary, he himself will growl threateningly. They stand in the mouth of the Roboraptor WowWee Roboraptor, in the chin and tail. Thanks to them, he reacts to touch, turns his head, turns his neck, moves his jaws and tail, becoming even more like a living one. The infrared sensor system helps determine the obstacles, so when walking the robot Roboraptor WowWee does not encounter obstacles but bypasses them. Sound sensors allow reptiles to distinguish between noises and respond to them with different actions, vision sensors provide recognition of surrounding objects. Artificial advanced intelligence helps reptiles decide whether you are a friend or a regular meal. Free walk. With his task, Roboraptor WowWee moves around the room, tracking down prey and carefully avoiding obstacles. He picks up all the sounds, stopping and listening. Can turn on claps or perform other actions within the activated mode. 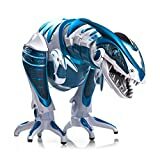 In addition, the radio-controlled robot Roboraptor WowWee changes mood: it can become wary and even aggressive from a friendly one. Important: So that he does not bite with his plastic mouth, always, before stroking the beast on the head, you need to check what mode he is in. 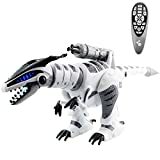 Works interactive toy Roboraptor WowWee from batteries. They are bought separately: 3 pcs. AAA type and 6 pcs. AA. Roboraptor WowWee Roborapter squeals, snores, hissed and snorts. Sometimes it is playful and absolutely not scary: when the sensor touches the lower jaw, the robot makes an almost gentle purring, bending over to the hand. But his mood is changeable: sometimes he becomes a real predator, with whom you should not joke. More than 40 preset functions. There is nothing to say about cons: what can such an exciting radio-controlled toy carry the negative? The advantages include excellent workmanship, unprecedented realism, equipment with many functions. Watching the habits of a real dinosaur is great! But, even more interesting, is to tame a predator who will become an obedient performer of your teams. Today it is easy for Roboraptor WowWee to buy at regular toy stores or order with delivery via the Internet on our website.